Posted on Tue, Mar 13, 2012 : 5:44 a.m.
Hoffman’s technique is getting stronger. I wrote at the time of “An Invitation to the Moment” that there’s an attention to detail in her work that makes the art close to a sort of hyper-realism. The same is true of the work in “Of the Water,” yet the newer works are more deliberative. Well, all the little things are back on display in “Of the Water.” But now they are supplemented by an increasing reverence for tranquility that gives each artwork the appearance of a captured reverie. Hoffman's paintings are overtly homages to stillness and silence, yet their colors are exceedingly rich and lively—with strong contrasts in light and shadow. This strategy can be seen in all the paintings of this series. But best is the memorable title work of the display, “Of the Water.” It’s likely no accident that this painting has been singled out for distinction, as it displays all of Hoffman’s strengths in an exceedingly serene composition. “Of the Water” illustrates an attractive mute swan family at rest in a pool of water. The two adults are accompanied by a cygnet, and all three birds are the only representative elements of a painting that would otherwise be a sort of geometric abstraction. The key to the painting is most certainly its attention to detail. 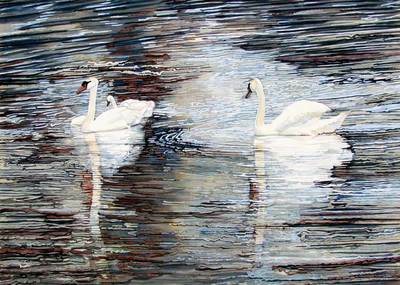 The painting’s ripples restlessly run across the entirety of the work and they give the painting an internal harmony that contrasts with the handsome swans in the heart of the painting. The swans’ reflection in the water complicates the painting with multifaceted rows of contrasting chromaticity. This strategy, too, creates a dynamic interaction inside an essential stillness, generating a dramatic internal unity. 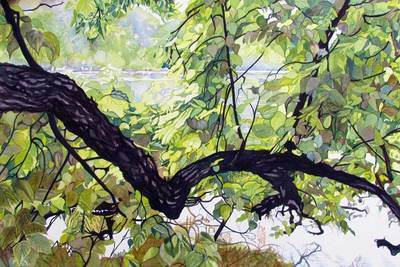 Hoffman’s “Of the Water” is, like the best of her art, a complete worldview given over to silence. While the theme of her exhibit may be water in this instance, at its core it’s really a meditation on tranquility. “Marlee Hoffman: Of the Water” will continue through March 24 at WSG Gallery, 306 S. Main St. Gallery hours are noon-6 p.m. Tuesday-Thursday; noon-9 p.m. Friday-Saturday; and noon-5 p.m. Sunday. For information, call 734-761-2287.